This production opened on August 9, 2006 and closed on August 14, 2006. A Production of Children’s Summer Theatre! fosteringArts.org’s Swamp Meadow Community Theatre was excited to announce the premier of its Children’s Summer Theatre. We’d had such an overwhelming response to auditions for all of our plays and had seen such talent in young actors and actresses that we decided to sponsor a summer theatre for young people between the ages of 6 and 16. Auditions were held June 7-9, 2006. Performances were held at Captain Isaac Paine School, 160 Foster Center Road, Foster, RI (directions). The audience could bring a blanket and a picnic to enjoy our outdoor performances at Foster Fair Grounds or Pascoag Library Park. Route 6 to junction of Route 94 (blinking light). Turn south onto Route 94 and proceed a very short distance to school driveway on left. Here is our cast list. 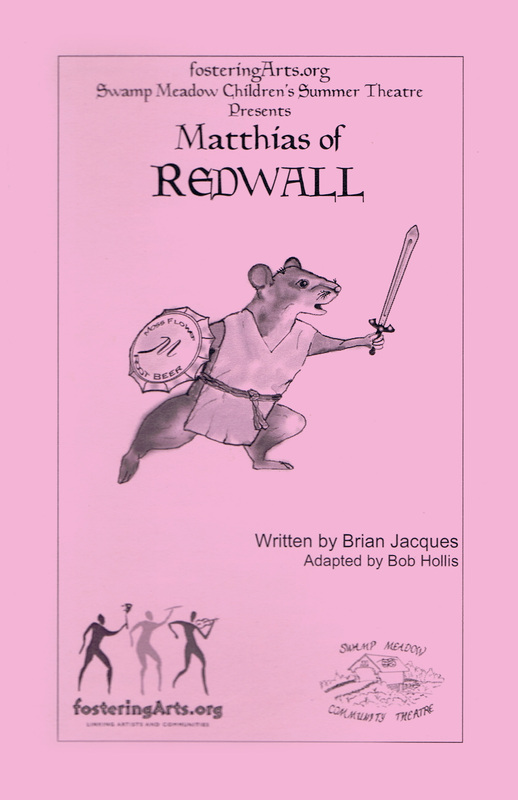 See how many people you know who were in Redwall. Heading the list of characters was Lucas Henry as Matthias. Other Redwall Abbey players were Heather Christie, Emma Capron, Tyler Worcester, Krystal La Valley, Ana Capri Mauro, Rosemary Paolucci, Giovanni Colasante, Katherine Carchia, Kyla Duffy, Leah Kiernan, Michelle Chretien, Emily Colasante, Heron Kennedy, Lilly Hearn, Michelle Chretien, Emily Chretien, Jillian Cerullo, Cara Drew Vierra and Flannery Brown. Haley Talbot played Cornflower, one of the Local Mice. Others in this group were Tatum Coutu, Isabella Giorgianni, and Antonio Colasante. Chance Andersen and Phil Colasante headed the Mossflower Woods characters as Basil Stag Hare and Constance Badger. Joining them were Kayli Robinson, Caulder Brown, Amanda Wilson, Laura Wilson, Sarah Wilson, Haley Tartaglia, Laura Fusco, Aidan Lurgio, Noelle Miozza, Elizabeth Krug, and Hannah Provost. The Mossflower Fringe characters included Nathan Miozza, Kyla Duffy, Tess Coutu, Leah Kiernan, Logan Cruz, Lizzie Russo, Brian Wolf-Jensen, and Andy Bergemann. The Sparra Court was headed by Chase Lurgio who plays Warbeak. Other members of the Sparra Court are Jacklyn Smith, Dacia Cruz, Heather Fernandez, Sam O’Neal and Lilly Hearn. Jake Wolf-Jensen played Cluny, the leader of the rats. He was joined by Cameron Marcotte, Julia Aronld, Olivia Harrison, Scott McGill, Kate Krug, Ashley Griffin, Sierra Kennedy-Tanner, Logan Cruz, Alex Cerullo, Kyle Pickard, and Mariah Harrington. Several actors played more than one role.